Despite not being able to see the LG 88Z9's upscaling tech in action, the 88Z9 looked truly special. Detail levels are really incredible and the extra resolution helps the picture enjoy a greatly enhanced sense of depth with large scale. Too bad it's going to cost way more than the vast majority of us will be able to dream of affording. 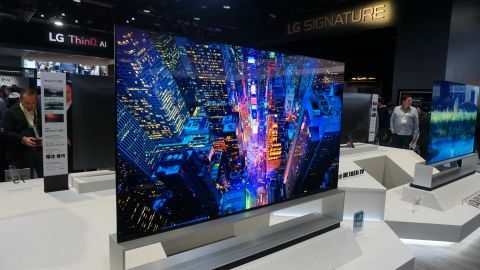 LG is arguably responsible for the two most singularly impressive sights of CES 2019 so far: the ‘rollable’ Signature Series OLED TV R we’ve covered in a previous article, and its jaw-dropping cousin, the 88-inch 8K OLED TV. While LG has shown off 8K OLED TVs before, the 88Z9 model is the first one that’s definitely going to go on sale to consumers. And it’s just about as consumer friendly as such a monster of a TV could ever be. So just how good does an 8K iteration of the world's best TV technology look? Here's what we found. Its design, for starters, is just gorgeous. Despite the enormity of its screen, it still manages to look incredibly thin over the majority of its beautifully polished rear side. Its gleaming black bezel is unfeasibly narrow too, leaving you scratching your head at how such a gargantuan screen could possibly support itself on such a trim chassis. There’s nothing about the design that suggests it’s in any way fragile, though. Even though an eye-catching facet of the design is the way it slots into the top of a new silver cabinet floor-stand (into which you can place all your source equipment). Even though the sample we were shown in a hotel suite at the CES was very much a pre-production model (the finished articles aren’t expected to go on sale until the second half of 2019), it delivered a truly spectacular picture quality experience. The sheer scale of the 88-inch picture is impressive in itself, of course. Especially given that it’s appearing from such a trim bit of hardware. But this sort of screen size also does a great job of justifying the introduction of 8K to the TV scene. For there’s just no denying that fitting an 8K pixel count into such a large screen makes it almost impossible to see any visible pixel structure in the image - even if you stick your head right up to the TV (which, by the way, you do not have to do to appreciate 8K’s benefits on this set). This freedom from physical image structure means that diagonal and curved edges appear free of jaggedness, while fine lines are all immaculately defined rather than being lost ‘between pixels’, or partnered with noise. Detail levels are really incredible too. Shots of a forest around a lake, in particular, looked sensationally life like thanks to the amount of leaf and branch detail you could make out in the trees, and the incredibly fine ripples on the lake surface. It’s not just in this sort of far-beyond-4K detailing that the 8K resolution makes its mark, though. The extra resolution helps the picture enjoy a greatly enhanced sense of depth with large scale shots such as the lake and forest footage, or a night-time helicopter shoot across London. Joining the stunning 8K sharpness and lack of visible image structure in the 88Z9’s pictures were all the usual OLED strengths - most notably an extremely wide effective viewing angle, stunning black levels (London’s night-time skies looked pitch perfect), extremely rich colours and exquisite contrast. What’s more, the 88Z9 carries all the new picture processing goodness contained in LG’s more mainstream 4K OLED TVs for 2019, plus some extra clever tweaks to help it deal with upscaling non-8K sources to the native 8K resolution. We weren’t able to see this upscaling in action, sadly, as LG was showing exclusively 8K content (delivered, so we were told, via a full bandwidth HDMI 2.1 cable running into the TV’s HDMI 2.1 port). But with LG’s standard 2019 processing doing a great job of making HDR footage look brighter and more dynamic than it did on 2018’s LG OLEDs, we see no reason to expect the crucial extra upscaling processing provided for the 8K screen to do anything less than a great job. One other thing that caught my eye about the 88Z9’s mind-boggling pictures was how natural motion looked compared with what we’ve become accustomed to seeing with LG OLED TVs. The 8K models’ seemingly reduced judder levels were particularly noticeable during the dynamic helicopter footage over London - yet at the same time we didn’t sense any significant drop off in the extreme sharpness and detailing of the native 8K images. Very impressive. If we're being picky, the pre-production sample we saw seemed to suffer with a little black crush in the darkest areas, and showed a vertical ‘seam’ of elevated brightness a few centimetres wide running down its screen. The latter of these issues was almost certainly just a result of pre-production problems or shipping damage, though, while it’s perfectly possible that the crushing will be improved during the final image tuning process the TV will go through before its release. In any case, even in its pre-production state, the 88Z9 looked truly special. Which makes it all the more unfortunate that while LG is yet to confirm pricing for its 8K OLED beast, you can bet your already outdated 4K Blu-ray collection that it’s going to cost way more than the vast majority of us will be able to dream of affording.